Miss Anna is an Art Therapist who visits our Preschool every week to offer her “Art with Anna” enrichment class to our students. The children listen to a story, create a related art project while listening to music, and enjoy their lunches together. Miss Anna’s mom, Mrs. Palladino, assists her in the class. 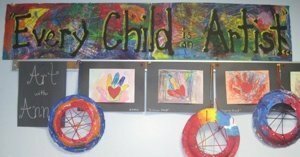 Watercolors, powdered tempera paint, chalk, oil pastels, glue, scissors, tissue paper, tin foil, cotton balls, ink, markers, pipe cleaners and more have been used to create their masterpieces! 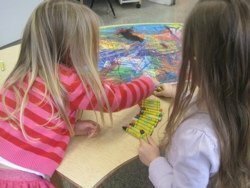 The children are challenged to express their creativity in each project and explore different materials in each class. Art and mathematics have a long history of working well together. Our students learn about lines, shapes, sizes, dimensions, and colors. Our youngest group just painted quickly or slowly depending on the tempo of the music they were listening to. We’re thankful that God has blessed us with Miss Anna and Mrs. Palladino and that they’re able to share their amazing talents with our students. Art with Anna Enrichment Classes are offered on Wednesday in the Fall, Winter and Spring sessions for our four- and five-year-old students and on Thursdays in the Spring session for our three-year-old students.